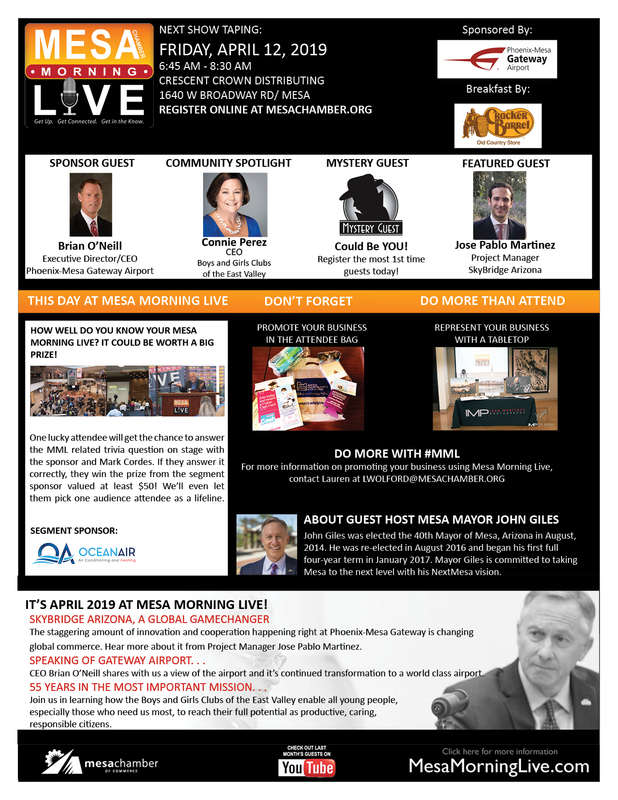 Produced by the Mesa Chamber of Commerce, "Mesa Morning Live" is a monthly morning talk show that discusses a variety of topics with hilarious one-liners from host and veteran valley comedian, Mark Cordes. The show features a diverse lineup of local, state and national guests including community leaders, politicians, celebrities, athletes, local businessmen and women, and more. A regular segment each month is Mark's highly anticipated "Top Ten" which includes humorous topics such as "Top Ten Ways to Balance Arizona's Budget" or "Top Ten ways to avoid weigh gain over the Holidays" or simply based on current events. The result is a one-of-its-kind humorous yet informative program televised for the entire community on Mesa's Channel 11.